We value the education, experience and unique skill-sets that each of our trainers bring to the table. In collaborating as a team, we are able to effectively work with people to strengthen the human-canine relationship. With exclusive access to our training programs and curriculum, each trainer on the team is able to teach you (and those close to you) the information and training techniques to help you reach your goals. Team members are able to consult with one another throughout your training program, and continue improving their knowledge and skills through the process of professional development. We are constantly learning and striving to better ourselves as professional dog trainers, which gives us the confidence to achieve success with you and your dog(s). 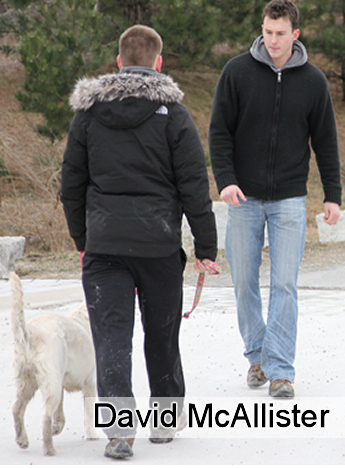 ﻿David is a professionally trained and certified dog trainer. He completed his Master Dog Trainer apprenticeship after finding a passion for dog training while working with his adopted German Shepherd. He has a strong understanding of Human and Dog Psychology and is a professional member of the International Association of Canine Professionals (IACP). Founder and Director of Niagara Dog Training Ltd.
Sabina has studied animal behaviour and she understands what kind of tools to use to properly train your dog. By understanding what motivates specific behaviour, you can address the root of your dog's unwanted behaviours. From there, you can move toward a happier, healthier relationship with your dog. 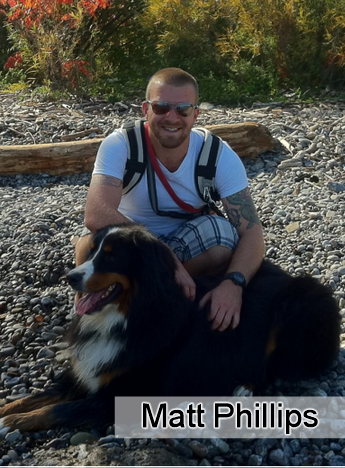 ﻿Matt Phillips is a certified dog trainer who graduated from Animal Behavior College in California. He has years of experience working with obedience and canine behaviour. Through the use of a calm assertive attitude along with positive reinforcement techniques, Matt works with dogs to allow them to learn naturally and is dedicated to making your dog the best fit possible for your family. Expert in behaviour modification, helping people to assess and address problems such as dog and/or people aggression, fear, dominance, excessive barking, running away, and other nuisance behaviours. ﻿In ﻿memory of Steve Purves, a great friend and amazing dog trainer. Steve was supportive of Niagara Dog Training in the company's early days and contributed to the established name that we are so proud of today. The feedback from our clients about Steve's training abilities was overwhelmingly positive and he will always be remembered as an important team member who inspired us to continue doing what we do so well. We are looking for qualified dog trainers who are interested in joining our growing team to provide puppy training, canine behaviour, in-home boarding and board & train, as well as obedience services from the Niagara region to Mississauga. Depending on you location and training experience, we can determine where you may fit in our organization. Please send your resume to info@niagaradogtraining.com or submit the contact form here.